In 1935, the Chevrolet Suburban was born out of the idea that consumers needed a heavy-duty, truck-based station wagon that provided incredible utility. Three-quarters of a century later, it has remained just that. Earlier this year, Chevrolet unveiled the 75th Anniversary Diamond Edition Chevrolet Suburban to commemorate all of the years it has been on the road. When the Suburban first hit the market in 1935 – it was a very different time for the United States. The total population was only 127 million and first-class stamps were only 3 cents. There were no import brands from Japan, let alone competitive Korean cars, and the word “hybrid” was hardly used in the English language. It was a different time in the U.S. and an even more drastically different time for the automotive industry. In the interim, the Suburban became an icon as the entire industry’s longest-running nameplate, having a longer lifeline than entire brands such as Volkswagen and Toyota. Throughout the early 1930s, most manufacturers offered only car-based wagons for professional use. Open models, known as depot hacks, were used to transport people and cargo around train stations and boat yards. Enclosed models typically did not have rear seats and were called “sedan deliveries”. Since wood and canvas were used for the bodies and roof, the car-based chassis and bodies were quite damage-prone. This compromised their effectiveness and durability, so Chevrolet saw fit to start work on an all-steel wagon body atop a commercial chassis. 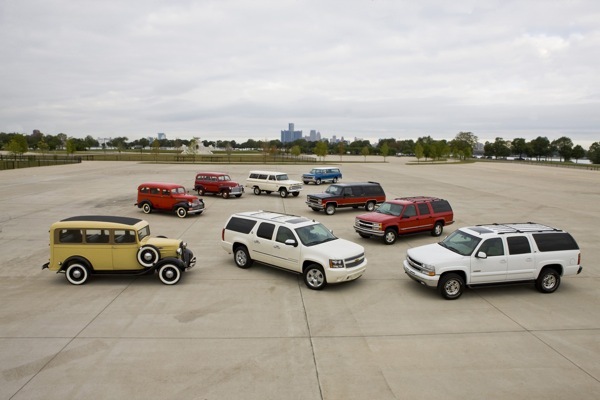 Thus, the Chevrolet Suburban Carryall was born. The original Suburban had seating for 8, had a 75 inch-long and a 77 inch-high cargo bay. Today’s latest model can seat up to 9 and is capable of holding an immense 137.4 cubic feet of cargo with the second row of seats folded and the third row removed. Originally priced at $675 ($10,900 in 2010 dollars), the Suburban was a steal. However, the origional model did not have the modern amenities that we’ve become accustomed to, including heated seats, OnStar, dual front and side airbags, ABS, stability control, keyless entry, or an automatic transmission. In stark contrast to today’s Suburban, a radio, heater, clock and even the rear bumper were options on the original Suburban. GM’s press release even jokes that it might as well have been called a “sport utilitarian vehicle.” Har, har, har. Car-based commercial vehicles remained in production throughout World War II, but heavier-duty vehicles based on commercial chassis began to gather more favor with professional and private customers who appreciated the capability, much like today’s private customers. Fast forward about 60 years, when the Suburban hit the mainstream in the 1990s with the SUV boom. And while many customers were new to the Suburban marque at this time, there were many other lifelong patrons who owned several examples throughout their lives, using the bow tie super wagon to haul anything from Little League players to horse trailers: just another example of three-quarters of a century’s worth of versatility.